At Keir Hardie we believe a creative curriculum empowers our children to become independent, open minded, resilient individuals. Our curriculum is enriched through frequent educational visits, visitors and the expertise of a range of arts specialists including dance and drama teachers, a story teller and music tutors. We enhance the children’s learning with a wide range of extra curricular clubs and activities. Our school is highly equipped with the latest state of the art technology. Our links with Newham Music Academy, Rokeby Specialist Maths and Languages School, the University of East London and Cumberland School Sports Partnership enable our children to access high quality teaching by specialist staff whilst also participating in interschool competitions such as debating, performance poetry and cheerleading. Education influences and reflects the values of society, and the kind of society we want to be. It is important, therefore, to recognise a set of common values and purpose that underpins the curriculum at Keir Hardie Primary School and enables the school to achieve its aims. We value creativity and this is seen as the strength of the school, this is reflected in the high standards of pupils work celebrated around the school. Our curriculum is broad and balanced, providing a wide range of knowledge, skills and experiences, giving each subject sufficient time to contribute to the children’s learning. The planning process is central to the effective delivery of the curriculum. 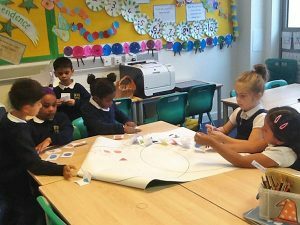 Our teachers start from the point of finding out what the children know and what they want to find out and use this information, together with the key skills required in each subject by the National Curriculum, to inform their planning. The main emphasis of planning in the school is to make the curriculum relevant to the child’s learning by making explicit cross-curricular links. We want all our pupils to enjoy reading, and read confidently with fluency and understanding. We aim to achieve this by providing children with broad, diverse and quality reading materials and monitoring each pupil’s reading development. Using these texts, we draw out questions which support the pupils in reading for meaning. All children are read with twice in every week, once with the class teacher and once the other adult in the classroom, this means that continual assessment of the individual pupil’s reading abilities is considered and they can be moved on to more challenging texts as soon as they are ready. We develop a positive environment that promotes reading and writing as enjoyable and worthwhile activities. Pupils have opportunities to read through all aspects of the Curriculum, with the emphasis on basic skills and language enrichment. Following a more Creative Curriculum ensures that language and literacy are central to every subject at Keir Hardie. Much importance is placed on fostering the child’s skills to use the spoken and written word in order that they can operate to the best of their ability. To ensure all pupils are engaged and challenged within writing we use the Pie Corbett ‘Talk 4 Writing’ scheme. It is powerful because it enables children to imitate the language they need for a particular topic orally before reading and analysing it and then writing their own versions of the text type. To support the continued improvement of handwriting across the school, our pupils are being taught to write cursively using ‘Pen Pals’. This scheme of work breaks down joins and individual letters to ensure all children can mimic them and eventually use them unsupported within their writing. To ensure our pupils are developing their language, we teach spelling three times a week focussing on the spelling rules as outline by the National Curriculum. This promotes understanding of the spelling beyond rote learning and means that children can apply this understanding to other words that will not have necessarily been taught yet. Reading – please click on the link to find out more. In teaching mathematics we cover the National Curriculum using the Inspire Maths programme, which uses concrete, pictorial and abstract approaches. This is a whole school primary programme based on the Singapore Maths ‘My Pals are Here’. 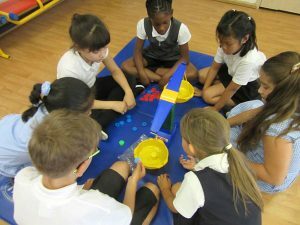 We want to enable all children to develop critical thinking skills, make mathematical connections and become confident mathematicians. We ensure that children receive quality teaching through modelling and the use of manipulatives to deepen children’s understanding. 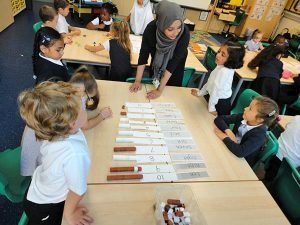 Children are encouraged to explain and justify their answers using mathematical vocabulary when solving mathematical problems.